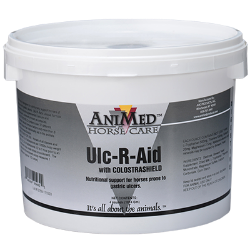 Designed to nutritionally support horses of all ages with gastric ulcers. Combines natural supplemental calcium and magnesium, commonly known as antacids, with the protective healing properties of Colostrashield, “mother nature’s protective shield", which contains over 37 important natural immune factors and more than 8 growth factors that aid in combating illness while protecting against infection. Horses of all classes and ages feed 1 to 2 tablespoons per 1000 lbs. body weight daily. Or, 2 to 4 tablespoons 1/2 to 1 hour prior to an event which may create stress or excitement. The large end of the enclosed scoop measures 1 tablespoon (approx. 1/2 ounce).